Join us for a discussion, in cooperation with Divadlo v Řeznické, featuring American playwright and actor Bill C. Davis. Mr. Davis will talk about his theater work and will let you peek into some of the current trends in American theater production. 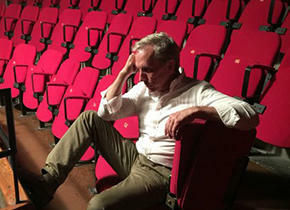 Mr. Davis will premiere his play Expatriate at Divadlo v Řeznické in Prague on November 23. Bill C. Davis is an American playwright and actor. Born in New York, he attended a local Catholic school and later worked in a community assisting disabled people. This is where he drew inspiration for his best known play Mass Appeal. The play was later adapted for screen with Jack Lemmon and Zeljko Ivanek - and received numerous accolades from critics.